Having a puppy is very similar to having a toddler. They get into things they shouldn't, they are messy, and taking care of them qualifies as one of the toughest full-time jobs. Just like a baby playpen, a puppy playpen keeps active puppies safe and confined so they can play around and keep their messes in one place. Whether you are in your house and trying to keep your carpet safe from possible accidents, or outside and trying to keep your puppy safe from running away or getting into something it should not, a puppy playpen is always a great device to have on hand if you are a puppy owner. 1. What Is a Puppy Playpen? A puppy playpen is a freestanding enclosed space for your puppy to play in safely. Puppy playpens can be made of a variety of different material. The idea is that your puppy have a safe space in a confined area where it can play with its toys without getting into things it should not. The better puppy playpens are able to conform to different spaces and feature a puppy door for easy in and out access. 2. How Does a Puppy Playpen Work? Puppy playpens are very similar to child Pack 'N Plays that keep a child confined and safe in a worry-free area. 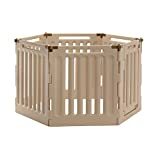 These playpens can be set up to complete a circle that keeps your puppy confined inside, or they can act more like a wall blocking your puppy so it stays in a designated space of your house. Many people choose to confine their puppy in a room with hardwood or tile floor while they are being potty trained. These playpens are great at keeping your puppies accidents confined to one area. 3. Where Can You Buy a Puppy Playpen? All of the puppy playpens we reviewed, as well as many more, can be purchased from Amazon. If you have Amazon Prime, you can receive most of these playpens in as little as two days. Be sure to check all of the options on Amazon because many of these playpens come in different sizes and colors. 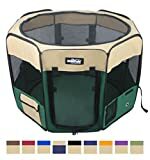 The following puppy playpens were reviewed based on parameters such as Features, Pros & Cons, Price, Where to Buy, Safety, and Ability to Travel. Each pet owner is looking for different features when it comes to a playpen These 10 options give a variety of positive and negatives. Some of these playpens may work better than others, whether because of the size or the material. The price range of the following puppy playpens ranges from anywhere between around $30 to around $250. The cheaper models are not nearly as durable and many times are not large enough for medium to large active puppies. The more expensive models feature durable material and the ability to break down and travel with ease. This puppy playpen is one of the best on the market! It is actually suitable for dogs, cats, and other animals. The top of the playpen tilts inward making it nearly impossible for an animal to get out. The best part is that it comes in 10 different sizes and nine different colors meaning you will be able to find the perfect puppy playpen for your new companion no matter its size. This puppy playpen can be purchased for around $80 to $85 from Amazon. This is one of the more simple puppy playpens. It is made for four panels with one of them including a door. It is slightly smaller at 42 inches around making it not completely ideal for puppies that are really active or slightly larger. You can purchase a mesh roof to go overtop making it impossible to escape; however it can get hot out in the sun with the roof on. This playpen does not have any type of flooring that can be removed and washed, so be careful where you place the playpen. If your puppy uses the bathroom there is nowhere to clean it up. This puppy playpen can be purchased for around $45 to $50 from Amazon. This is a classic wire puppy playpen. There are not many bells and whistles; however, it gets the job done. This puppy playpen comes in multiple different heights making it suitable for puppies of all sizes. This is a feature many puppy playpens lacks. A door in one of the panels makes it easy for puppies to run in and out. Just like the puppy playpen above, there is no bottom to this playpen, which means your flooring is exposed to any puppy accidents that may occur. This puppy playpen can be purchased for around $30 to $35 from Amazon. This is a really cool puppy playpen because the walls are transparent meaning you can see exactly what your pet is doing at all times. This is one of the largest playpens, with one side being able to stretch 80 inches. An awesome feature about this playpen is that it can be molded into different shapes and sizes to fit your room perfectly. Although the walls are plastic, the way this playpen is built to makes it really hard for puppies to chew on the pen. This is a completely collapsible all mesh and waterproof fabric puppy playpen. This pen has a roof and a floor making it easy to contain messes. It comes in three different colors but does not come in different sizes. With a height of only 25 inches and not even double that in circumference, this puppy playpen is great for newborns but is not suitable for a puppy over the age of two months. 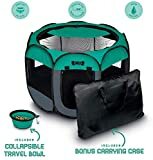 This puppy playpen can be purchased for around $60 to $65 from Amazon. This is an incredible puppy playpen for puppies of all ages. With three different size options, and the largest being six feet tall and 8 feet long, this wire playpen gives your puppy plenty of room to run around in. This playpen does not have a flooring, but it does have a roof to protect your dog from the elements if you choose to keep this outside. Since the base of the cage is wire, the roof will not trap heat inside and overheat your dog. You can purchase this puppy playpen for around $581 to $590 from Amazon. Wire playpens are always a good option. They are extremely hard to chew through and are not easy to knock down. This being said, any playpen needs to be tall enough to keep your dog inside. If there is a way to get out to the free world, your dog will find a way. The height of this puppy playpen is the only disadvantage. It only reaches 24 inches tall making it extremely easy for a notable sized puppy to jump over it. 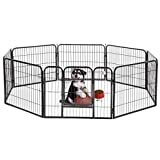 This wire puppy playpen is one to strongly consider because of its six different height sizes. 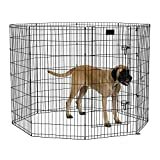 If you just need to keep your puppy confined in a safe space for a period of time, this is a great puppy playpen option for you! 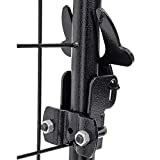 This wire playpen is available with or without a door, but the price difference is almost non-existent; so you are probably better off getting the one with a door for flexibility. This is a great pack 'n play puppy playpen. It comes in three different sizes and collapses down to a tote bag size making it extremely easy to travel with. Although it comes in three sizes, the largest of the three is still not quite large enough for large puppies to be comfortable in. A bonus with this purchase is a collapsible water or food bowl. You can purchase this puppy playpen for around $35 to $40 from Amazon. When you think of a puppy playpen, this is probably what you imagine. This is a sturdy and very versatile playpen for any size dog. You can connect the ends so that it creates a full circle, or you can spread it out along a doorway to keep your puppy trapped in one area of the house. It is made of a hard plastic that can withstand being beaten up without being damaged. This puppy playpen can be purchased for around $180 to $185 from Amazon. Puppies can be hard little rascals to take care of. All the help you can get is always appreciated. You shouldn't have to worry about your little ones safety or finding bathroom messes around the house. A puppy playpen is the best way to keep your dog isolated with its toys to give you peace of mind.